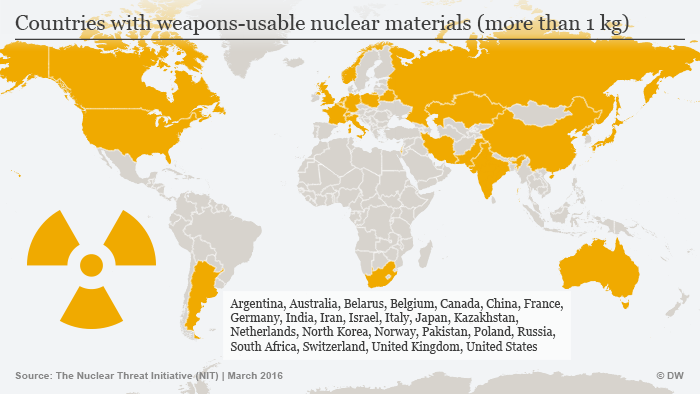 US President Barack Obama has made securing nuclear material a priority during his presidency. Substantial progress has been made, but gaps remain; particularly, in the area of military programs. As a two day nuclear security summit begins in Washington today, scores of world leaders will be grappling with how to keep fissile material out of the hands of would-be terrorists, and also securing nuclear power plants from cyber attacks. This has been a priority for the Obama administration, which claims to have made significant progress since its first such conference in 2010. In that time some 3.8 tons of nuclear material has been secured, enough to produce some 150 nuclear weapons, according to Ben Rhodes, deputy national security advisor to US President Barack Obama. Still, over the past two decades there have been nearly 3,000 cases of nuclear material disappearing,according to the International Atomic Energy Agency in Vienna. But Oliver Meier, a security expert at the German Institute for International and Security Affairs, tells DW that the number is not quite as ominous as it sounds. Many other cases involved material that could be used to build a so-called dirty bomb, which could spread radioactive material over a wide area. While such a bomb can cause health problems and create panic it is far less deadly than a nuclear explosion. 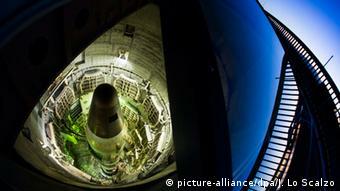 Although far less deadly than a nuclear explosion the threat is real, according to Meier. That perspective includes definitive revelations in the aftermath of recent terror attacks in Paris and Brussels that IS seeking nuclear material and/or the opportunity to sabotage a nuclear power plant. After the November attacks in Paris police found 10 hours of video surveillance detailing the comings and goings of a senior Belgian nuclear official. More recently, officials at a nuclear plant deactivated an employee’s entrance card after it went missing. “We have seen ample proof that terrorist organizations like Islamic State have no regard for innocent human life or international norms, and that only redoubles the need for us to have effective international nuclear security approaches,” said Rhodes, the US national security adviser. Belgian media have report that the El Bakraoui brothers, two of the suicide bombers in last week’s attack in Brussels which killed 32 and left more than 300 injured, were linked to IS efforts to infiltrate a Belgian nuclear plant. But such threats were already on the radar of security and intelligence experts, according to Laura Holgate, the US National Security Council’s senior director for weapons of mass destruction, terrorism and threat reduction. “Having a portion of the (summit) discussion that is focused on counter-ISIL is a decision that was made in January,” she said, using an alternative acronym for the Islamic State. “But it turns out that it is obviously very timely, unfortunately. Some 50 heads of state, or their high level representatives are attending the summit in Washington. But perhaps as noteworthy is who is not there: Russia and Iran. Iran, however, was not invited and Meier the security expert thinks that is a mistake, particularly in the aftermath of last year’s nuclear accord between Iran and the international community. In that agreement, onerous international sanctions against Iran were lifted in exchange for Iran agreeing to abandon the weapons component of its nuclear program. Much progress has been made in securing nuclear material in recent years, but Meier said there is still important work to be done.